Fortissima (in Italian and French) means strong. It's also a term applied to music. I found that to be a fitting analogy for this Fortissima 80% cacao bar from Francois Pralus (Roanne, France). A tasting experience for a chocolate can be 20 or 30 seconds long -- and might be compared to a short piece of music. The prelude in this case (following the hard snap (a sign of a well tempered bar) when I broke off a piece of bar to taste) was a very mild smell, compared to the strong, unified "chord" of three flavor(s) that dominated throughout this experience. Somewhere in the middle of this chord there was also a pleasant roasted flavor note, then the strong chord resumed. The finish melted away to nothing. 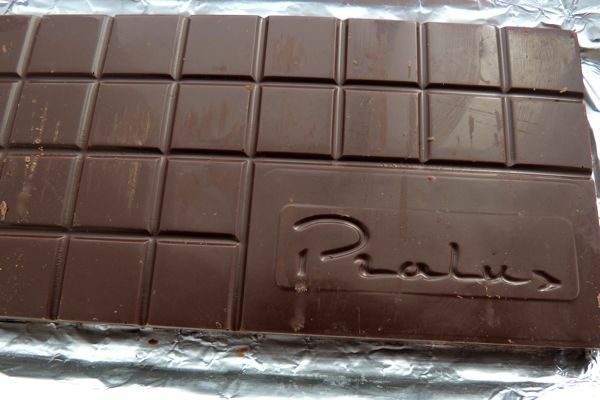 And speaking of melting, most Pralus bars have a deliciously smooth mouth feel or texture, similar to that of some other Swiss, German, French, Belgian and other European makers, in part due to cocoa butter, soy lecithin -- and, perhaps most important, longer conch times where particle sizes are ground down to smaller sizes, resulting in a more silky smooth texture. The trade-off with longer conching time can be loss of flavor (off flavors as well as interesting ones). 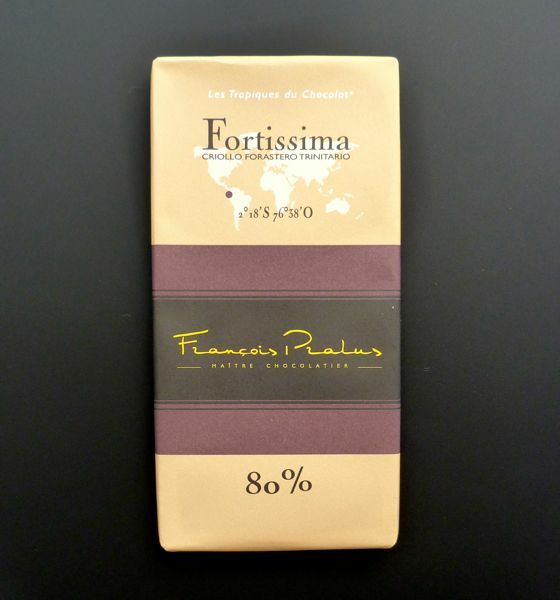 This Fortissima 80% bar was made using the beans from three types of cacao pods: Criollo, Forastero, and Trinitario. This classification is, in fact, an oversimplification (a subject of a future post), but if all three were musical notes on a piano, and you played all three notes at the same time -- you'd get a very strong flavor chord, especially if you used a stronger percent of cocoa solids. Not unlike this 80% cacao bar. So, Fortissima it is. As a handy reference (to origin) on this Pralus "Les Tropiques du Chocolat" bar, there was a map with a dot roughly where Ecuador is located in South America, with the following coordinates: 2 degrees 18' S 76 degrees 38' 0. Today was Day #10 of Chocolate and Ecuador Theme Week. Frequent visitors to this site will note that Chocolate Math does not always correlate with reality. Just as there are principles of Cartoon Physics where humor can alter perceptions of time and space, so it is with Chocolate Math here on Chocolate Banquet. A week may stretch from seven days to ten or eleven days in length. And, when you are enjoying chocolate, this is not such a terrible thing. Note: Today, I'm changing Post titles to reflect the name of the Chocolate of the Day, rather than preface every post title with "ChocolateBet:" followed by the date. The daily chocolate "bet" continues; however, after more than six years I think I've already conveyed this point.